Sue wants her books sold in bookstores. Sue wants to make a $5+ royalty per book. Two additional factors are going to determine if Sue can get a $5 royalty per book. The price point that the market sets for her book based on its genre and page count. Sue can control point 1 to some extent. Sue can not control point 2. Now for the backwards math to figure out what Sue needs to do in order to get her $5+ royalty per book. The market has determined that $20 is a fair price for Sue’s genre and page count of book, so she sets her retail price at $20. The bookstores will buy her book for $9 (45% of the retail price, aka a 55% discount). In order for Sue to make $5+ royalty from selling to that retailer, the print cost of her book has to be under $4. For a basic book to stay under the $4 print cost per book, (6×9 perfect-bound paperback, black and white interior, no duplex print on the cover, no perforations) Sue’s book can not exceed 210 pages. Sue’s book designer needs to be aware of these constraints before designing begins. Sue and her designer will work together to not exceed 210 pages. Each printer is different. A good book designer will help you walk through all of your options for the printer you have chosen. Test drive IngramSpark’s calculators here. 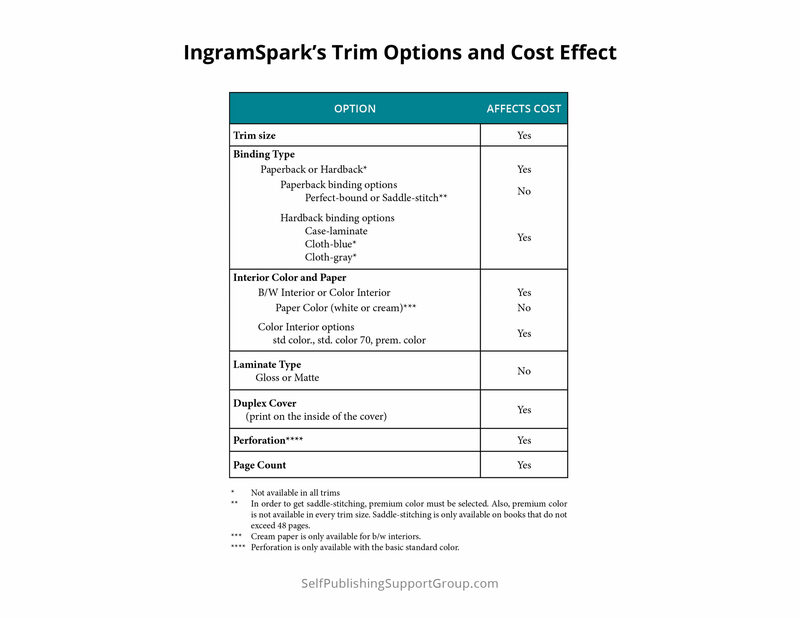 A previous article, “Print Costs and Royalty Structures for CreateSpace and IngramSpark”, may also interest you.